Enter your zip code below to find a BNI chapter nearby. You may also call (574) 535-3310 or send email to mdbotts@aol.com. Call (574) 535-3310 to find out how BNI can grow your business. BNI (Business Network International) Northern Indiana's purpose is to help businesses, large and small, grow their business and make more money. We sell hope! 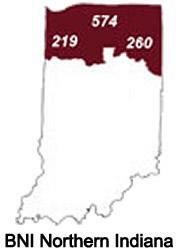 BNI Northern Indiana region is actively building business referral and networking groups. Click here for information about our chapters. BNI Application. Click here for a BNI Membership Application (PDF). More Information. The best way to find out about BNI is to visit a chapter. Please call (574) 535-3310, click here to send an email or complete the form on this page for assistance with visiting and/or joining a BNI Northern Indiana chapter. In 2018, the members of the BNI Northern Indiana region reported income in excess of $15 million in new business from BNI referrals! The 250,000 members of BNI worldwide passed over 11.2 million referrals which resulted in more than $14.2 billion in business.